Omaha Sands is a large Beach Home ideal for families and friends getting together at the beach to make for relaxing, carefree and memorable holidays away. Located in the heart of Omaha Beach and only a few minutes walk from the patrolled surf beach, the safe and tranquil estuary, convenience store, cafe and 18 hole golf course, the delights and attractions that Omaha Beach and the larger Matakana area offers are all very accessible from Omaha Sands. Large deck areas provide sea views taking in Ti Point, Little and Great Barrier Islands, The Coromandel and Tawharanui Peninsular. Open plan living area with two bedrooms and bathroom on the upper level; on the ground level, 3 separate large bedrooms and a second bathroom provide comfortable sleeping in real beds (3 queen beds, balance singles- no bunks!). Baby gear (cot, highchair and stair fence) available if required at no charge. A fish filleting station is provided and all will enjoy an evening soak with a wine in the new spa pool. 12 foot dinghy and life-jackets available for guest use. Flexible check in/out times, off road parking for cars and boat, wood fire and heaters for winter warmth, free Wifi internet, table tennis table, guest kayak and life jackets, Nespresso coffee machine. The Estuary and boat ramp are in easy distance for water activities. Out of respect for our neighbors, no parties. No smoking inside, Damages and Party Bond required. Linen (sheets, towels etc) may be available for an additional charge. Omaha is our family “Happy Place” easily accessed where we enjoy having a break from Auckland. Glorious elevated sea views, easy access to beach and amenities like boat ramp, golf and shop coffee! Large Sunset Deck with huge (comfortably seats 12) outdoor dining table. We stayed with a group of 8 of us to attend a wedding in Matakana and Omaha Sands was the perfect house for us. More than enough room for everyone, the house was clean and had everything we needed. Great location too, just a short walk to beautiful Omaha Beach. Chris was very friendly and accommodating, I would definitely recommend to others. What a magic spot you have! 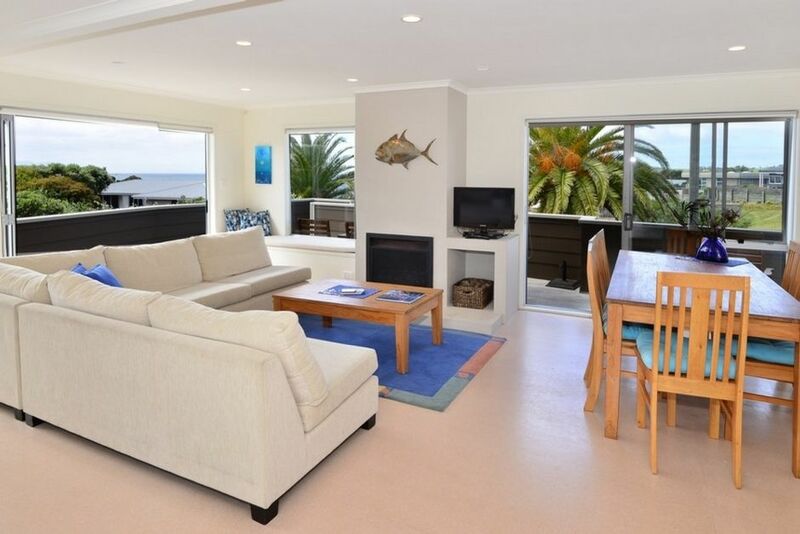 Hi first time users of bookabach, the property and location was great for what we wanted, it was clean, spacious, had everything there we needed, great indoor / outdoor flow and we loved it was a short walk to the beach out their back gate :) would certainly recommend. Everything we needed and so close to the beach. Wonderful space for children for playing. Excellent outdoor living for dining and relaxing. Chris was great with communication. Highly recommended. Comfortable, spacious and well equipt. A great place for a large group or family. Plenty of space and well equipt. Lots of things to do in the local area. Perfect property for our extended family winter wedding accomodation.